Loch Gorm, located to the north of the distillery is very peaty in colour, similar to the dark rich colour of our sherry cask matured single malts. This is the 5th installment of the Loch Gorm range and it’s been matured for over six years in Oloroso sherry butts. Named after a famously peaty loch, from which Kilchoman draws water for the production of this and other releases, Loch Gorm is bottled at 46% ABV. Nose: A heady mix of peat smoke, dark dried fruit, brown sugar, and menthol and/or eucalyptus. Taste: Light smokiness at the start followed immediately by those dark dried fruit notes as you work towards the middle. Cinnamon and brown sugar show up too. The finish is smoky, sweet, and lightly spiced while the aftertaste is dry with some lingering herbal flavors. The Verdict: A delicious and slightly complex whisky that would be a superb ending to a rich meal in lieu of dessert. 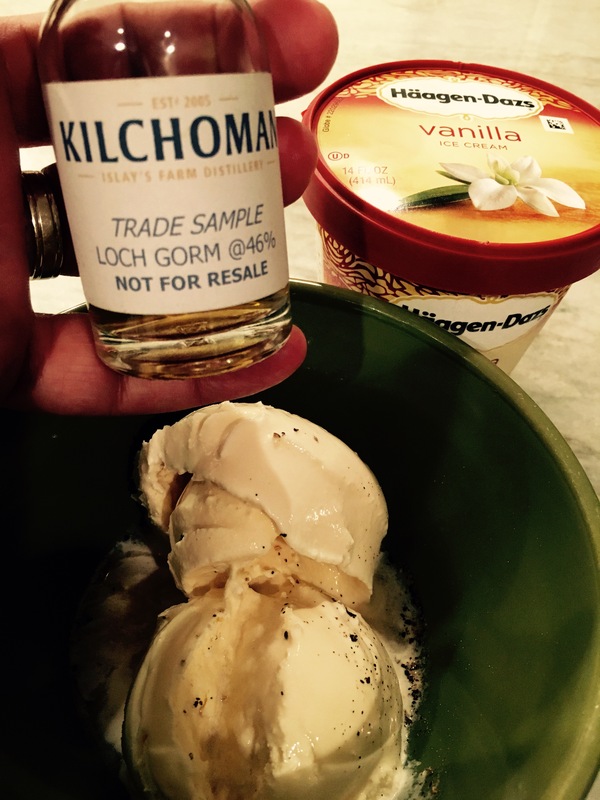 Kilchoman Loch Gorm + Haagen Dazs Vanilla Ice Cream + a dash of fresh cracked pepper = one supremely satisfying dessert! It was a little smoky, a little sweet, and a tiny bit peppery. And thanks to the Oloroso Sherry cask maturation of this whisky, it was just a wee bit fruity too. This combination of creamy ice cream and peaty whisky is a multi-layered flavor experience that I highly recommend. I say, “Go for it!”. You won’t be disappointed. Many thanks to Impex Beverages for providing us with this sample and to the West Coast Office for inspiring this post!